Melbourne technology consultancy, Transpire, has won a $2.7 million contract with the Government's Department of Veteran’s Affairs (DVA) to develop a BYOD (bring your own device) visitor experience. Transpire, which was formerly known as b2cloud, was established in 2009. The AWS partner rebranded as Transpire in the course of 2017. The solution is for the new Sir John Monash Centre at the Australian National Memorial in Villers-Bretonneux, France, and includes a beacon network engineered with custom-made antennae and software built by Transpire, a smartphone application and IT solution. The goal of the project is to allow visitors to be immersed in the Australian experience of the Western Front battlefields during the First World War. Visitors will be able to download an app in their mobile devices, which will be compatible to iOS and Android. The app will enable visitors to navigate the 480-square-metre gallery at their own pace, and in their chosen language. As visitors move through the centre, 450 Bluetooth beacons will determine their location, automatically prompting the 105 multimedia servers to launch video content to one of the nearest 450 screens and 10 projectors. To avoid signal congestion, Transpire engineered a custom-made radio frequency for the antenna to isolate, amplify and direct the signal of the beacons to smartphones. The app will also work outside the centre activating personal stories of some of the soldiers buried in the Villers-Bretonneux Military Cemetery using the smartphone’s geolocator. The app will also offer a 360-degree panorama and provide access to the National Archives of Australia database for visitors to locate the names of the almost 10,700 Australian soldiers who fought in France. 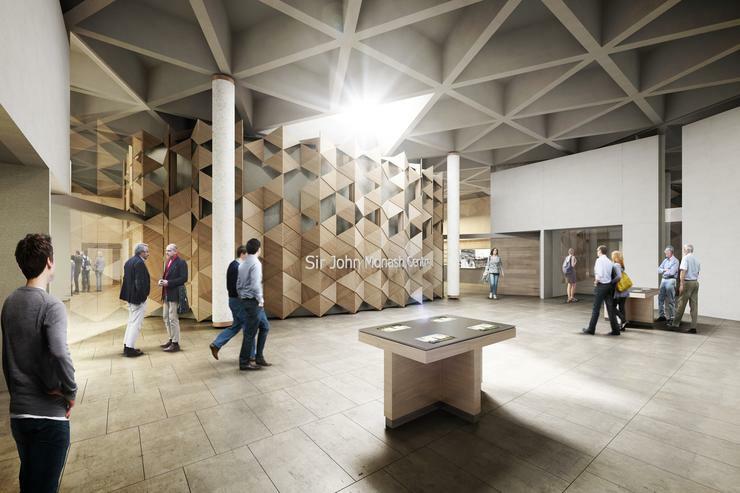 The app will offer visitors with a hearing impairment access to transcribed audio and those with a visual impairment access to audio content describing the centre’s artefacts. The centre will have visibility to data including how many visitors step through each zone or how long people stay in front of a particular screen. The centre, which is set to open in April 2018, is expected to receive 110,000 visitors every year.